The grand finale to the 2011 SCX series took place for the third year running at the Evergreen Fairgrounds in Monroe WA, home of the annual Snohomish county fair known as the Evergreen State Fair. Though featured in previous editions of the event, the moto racetrack and the animal barns played no role this year’s proceedings. Since the dirtbike aficionados and their RV’s weren’t competing for space, the course designers were able to take over the whole of the north field and parking area to create a 99% tarmac-free event – the knobby wheels would roll through almost nothing but mud: grassy mud, sandy mud, lumpy mud, soupy mud, and a very few traces here and there of slightly dehydrated mud. The additional space allowed teams to mount their tents course-side, whose proximity to the startline became a prized amenity given the weather. The course began on the flat field with a few tight turns leading into a long straightaway for the roadies before climbing into the upper meadow. Once there, the course snaked back and forth through some tight turns and fast corners before arriving at its exit point from the meadow: a steep plunge straight down the embankment. The descent curved around a tree and back up to an off-camber path along the hillside that led back to the main field through a swooping 180-degree turn. 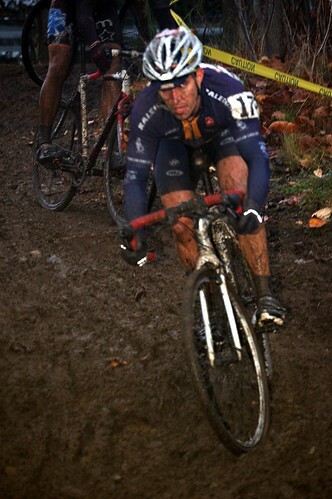 Racers then had to shoulder their bikes for a struggle up a second muddy embankment that called for deliberate foot placement and occasional hand support. And then it was on to stretches of frothy ankle-deep mud that demanded a light pedal and a fast churn. Riders emerged from the bog onto the course’s single solitary and short stretch of pavement for a quick spurt to a double set of barriers, returning off-road as the course zigged and zagged through two paddocks on its way back to the main field and a short straight dash to the finish line. The descent of the embankment figured as a decision point for most racers: should one risk mishap on the way down, only to be forced to dismount as a result traction failure on the following upbound segment, or was it better to dismount at the top of the precipice for a run down and back up? The miscalculations and conflicts, with their inevitable consequences, proved a source of hilarity and schadenfreude for the gathered spectators and bell-ringers. A faint simulacrum of dawn had barely broken somewhere above the leaden skies when David, Andrew, and Alex gathered at the shop for the trek out to the Snohomish valley beneath a constant drizzle. Once again, Alex piloted the trusty Recycled Cycles Sprinter safely to its destination, and we obtained a prime location right by the start line. It was a day for miseries and lots of dry extra clothing. The rain kept falling until the early afternoon, along with the temperature. 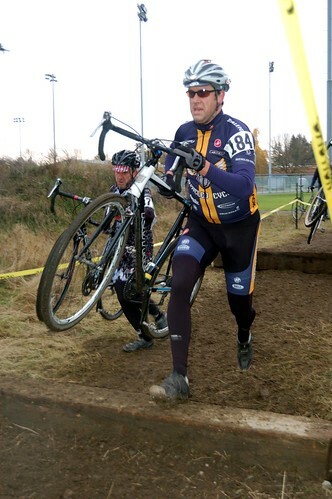 It was a day for hard-core fanaticism and commitment to cyclocross (or perhaps to an institution). 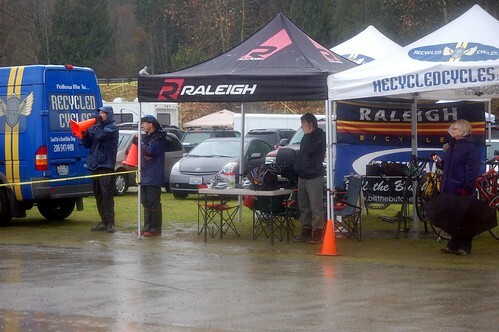 Rob showed up for the early race in the still-warm rain, cheered on by wife Amanda and young ones Charlotte and Thomas, who seemed unfazed by the weather, sure sign of a cx destiny. His morning race done, Rob took over the controls of the grill, and the air was soon filled with the smell of beef on the barbie, thanks to our fabulous meat sponsor Bill the Butcher. Arriving with Julie for the afternoon event, Beth found her vehicle unexpectely locked, a problem only because the key was of course located on the wrong side of the door. Drama was avoided in extremis when her husband evaded the highway patrol’s vigilance to arrive with another key and moments to spare. But in the meantime, Jeff had secured new numbers to pin on borrowed jerseys, and both ladies were thus seen dressed in white well after Labor day. In the meantime, Alex had taken off at noon with the other elite racers for a hour of fun in the mud. But he was to returned unexpectedly and all too soon to the tent, wearing a stoic grimace after a bruising encounter with the ground forced him to abandon his pursuit. Despite his misadventure, Alex showed a consistency through the season that yielded a ninth place in the series final standings. The rain had slowed to a thin drizzle by 1:30pm, when the successive waves of single-speeders, the cat 3 45+ men, and the elite women fields started off. David had another fine outing with the single-speeders, with a ninth place on the day that put him in the fifth slot in the final standings. He was joined by Rob who started and finished his second event of the day, a man on a mission to secure the ten starts that will allow him to upgrade into a field where the sandbaggers go even faster but don’t fall down quite so much. 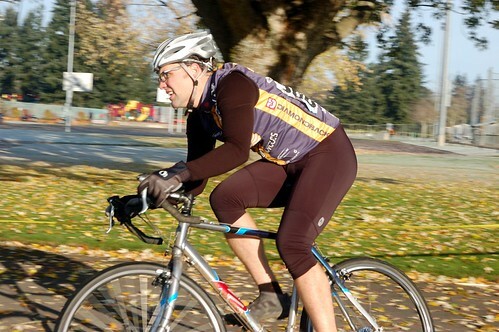 Starting with the 45+ men, Andrew didn’t fall down, but his knee warmer did. Forced to stop to remove it, he eventually wound up losing another sprint for a mid-pack placing to the same guy as last time. Beth came roaring past Andrew on the upper meadow, and he had a front-row position to watch her spectacular tumble when some other old guy forced her off her line down the embankment. Fortunately nothing was hurt, not even dignity as that gets left behind with the jackets on the start line. Beth finished with an outstanding sixth place, and a fourth place in the final standings. Dispensing with knee-warmers despite the increasing chill, Julie rode to an excellent eight place on the day, finishing sixth for the series. Finally, it was 2:30pm and Cat 3 men took the start of the final race of the 2011 SCX series, with RCR’s 2 Nicks joined by Jeff and Liam. By this time, the beer tent had opened and the festivities were in full swing, fueled by quantities of Nieuw Belgie’s fine brews. Thus we can only report seeing Nick A’s focused expression as he came down the hill, followed by Nick B. Jeff looked happy to be there. And we noticed Liam making an unscheduled service stop at the pit. Published results would later indicate that Nick A obtained a very fine ninth place, and an outstanding eighth place on final gc, where he’s followed by Nick B who hung on to his ninth on the final standings. Liam made up for a disappointing day of mechanical challenges by scoring a pair of wheels in the post race raffle. Andrew managed to spill half his second beer, which turned out to be inadvertently clever since he would occupy the driver’s seat in the van for the drive back to Seattle. All too soon, the party was over, the tents were folded and loaded, and the van set out into the fading twilight for the journey back to Boat Street. For many of us, the season has drawn to a close, and it’s time to take up winter sports such as skiing or knitting; but a few races remain for those still jonesing on cx and willing to travel to the far north or the far south. We offer our thanks to our fantastic sponsors who help make this all possible: our long-time title sponsor Recycled Cycles and bicycle partner Raleigh Bikes; Schwalbe Tires gives us great tread, Bill the Butcher keeps us fed, and PowerBar gets us gelled. 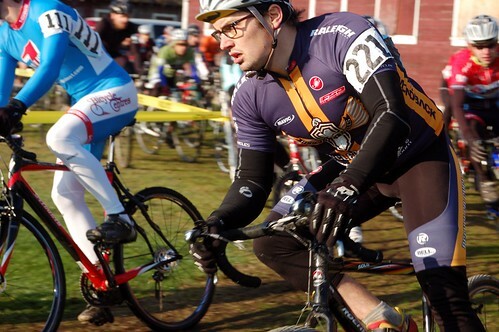 The sixth and penultimate event of the Seattle Cyclocross series took place this last Sunday at Sprinker Park, down in the South Sound town of Spanaway. South it may be, but the weather was far from southern, as the frigid night temperatures moderated only slightly beneath a wan autumn sun, a sun progressively dimmed by the vanguard of the cloud banks conveying the next week’s rain. The early morning SCX set-up crew found a parking lot covered in black ice, and the first wave at 9:15 would set off across still-rimy grass. 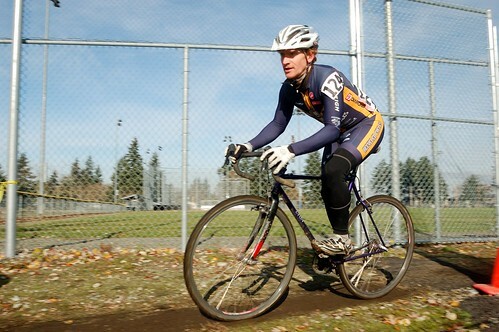 This was the fourth year a race has been held at Sprinker Recreation Center, a course developed after the loss of previous venues such Donida Farm, Kelly Creek Farm, and South Seatac Park. 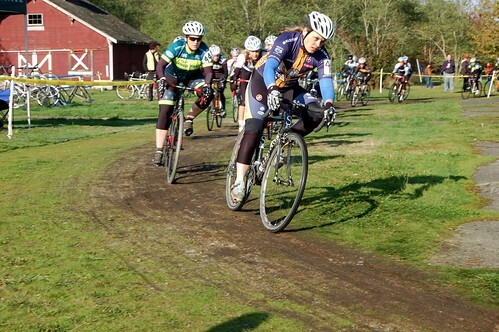 Though it has the advantage of parking aplenty, the venue’s limitations – available terrain confined to a narrow greenbelt surrounding baseball diamonds and soccer fields – have required considerable experimentation and ingenuity on the part of course designers to transform a difficult site into an acceptable cyclocross course, and this edition continues the progress of the work. With long stretches of tarmac and straight lines on grass to their advantage, the power riders were hampered only by a single set of double barriers and a pair of forced trots up short embankments. Dan Norton’s signature style of multiple hairpin turns required some cornering skill and power, but only the neophytes found much of a challenge in the couple of gentle off-camber sections and the downhill sandpile. With Alex the Red at the helm of the trusty Recycled Cycles Sprinter van, the RCR setup crew arrived to find a couple of spots still available for parking and tents relatively close to all the important features, such as the registration tent, the start line, and the sanitation stations. Shivering in the morning chill despite multiple layers, it seemed hard to believe that just a few weeks earlier we had been basking in the sun of a prolonged Indian summer. With the inclement weather, the travel distance, and various extra-curricular obligations, participation did not achieve the heights of previous weeks. 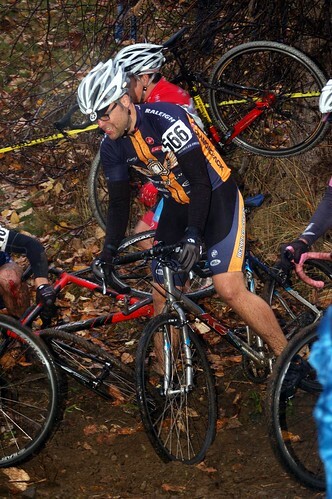 Nonetheless, the hardened core of cyclocross enthusiasts were present and accounted for. Taking the line in the first wave, Rob set off on an excursion through the frosty wonderland to finish well in the top half despite finding his way impeded by a fair amount of cyclocross slapstick on the part of the other folks in lycra clown suits. His efforts done, his real work began as Rob fired up the grill for the first batch of links and sliders furnished by our grand meat sponsor Bill the Butcher, purveyor of fine meat products from all-natural locally-raised beef. With long-time RCR-board-member-and-cx-stalwart Tyler stepping down from the Supreme Council after years of valiant service, Rob’s stepping into his galoshes to take on the responsibility for managing Team RCR’s vast financial holdings, and he looks forward to visiting the Cayman Islands in the near future (note to the IRS: that’s a joke – we know of no cyclocross races in the Cayman Islands). The early arrivals for the later races had plenty of time for lollygagging and strolling the course beneath the pallid sun as the next wave went off, bereft of blue-and-gold jerseys. The elite categories took off at noon, with Alex joining the open 1/2 field. The generally flat course with its low degree of technical challenge didn’t play to Alex’s advantage in a stacked field easily dominated by international-class sub-23 rider Zack McDonald, but he still managed to hang on to his 9th place in the series rankings. The 13:30 contingent was up next, David taking the line amongst the single-speeders, Andrew starting with the Cat 3 45+ crowd, while Beth and Julie sped along in hot pursuit with the rest of the elite women’s field. 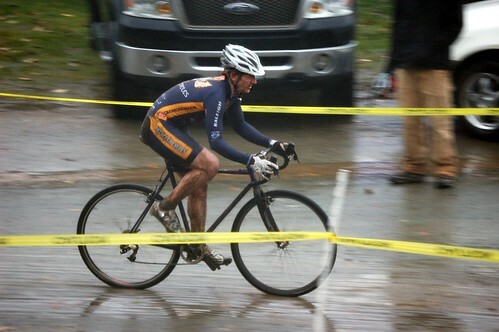 David had his best result of the season with a 5th place that sits him nicely in 6th place for the single-speed series. Beth almost closed her minute handicap on Andrew, dashing home for a 5th place on the day and a solid grasp on the sixth spot in the general classification for the elite women. The final event of the day beneath an overcasting sky saw five Recyclers line up at the start of the open Cat 3 race. Nick A took advantage of a course more suited to his characteristics to open a gap on Nick B, the latter still managing to cling to his top-10 series placing. 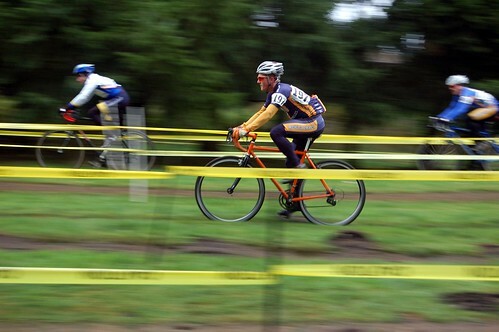 Returning to the races as a newlywed, Liam pedaled his velocipede of bright orange beneath matching foliage for his first race as a Cat 3, managing to hold off NewCarl’s valiant pursuit, while Jeff chased around after racers young enough to call him “sir”. And then the burgers were on their way to their final resting place, the tents folded and loaded with the grill, and the van was north-bound. 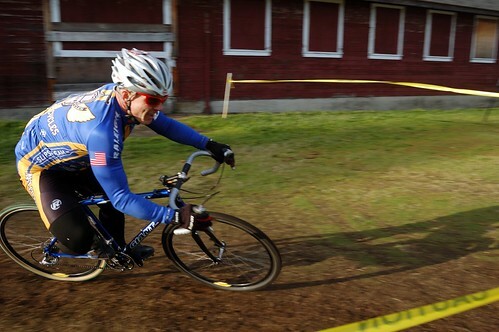 But we’ll be out next Sunday for the finale of the Seattle Cyclocross series at the Evergreen Fairgrounds in Monroe WA. The double points on offer should make for fierce battles as racers struggle to shuffle the series standings in their favor. As ever, we extend our gratitude to the wonderful folks at our long-time title sponsor Recycled Cycles and bicycle partner Raleigh Bikes for making this all possible; Schwalbe Tires helps keep us rolling along, Bill the Butcher meets our after-party protein needs, with pre-race glycogen top-ups supplied by PowerBar energy gels. 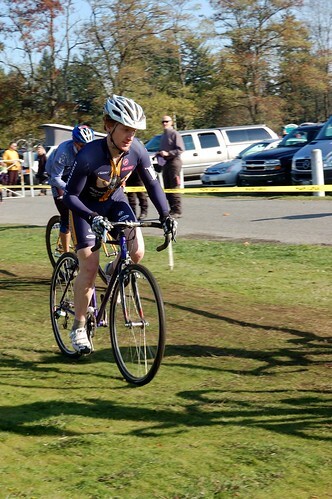 Last Sunday, Puget Sound Cyclocrossers visited Fort Steilacoom Park for the second time this season, as the Seattle Cyclocross series returned to Lakewood WA for its fifth installment. Seattle Cyclocross #2 had taken place under grey skies and occasional drizzle, but today’s event began with a chill, as the morning frost had barely melted away beneath a declining autumn sun. Course designer Dan Norton more or less reversed the course from the previous Steilacoom event, coming down where it had gone up, turning right where it had gone left, swerving here rather than there. But in keeping with Dan’s philosophy of hardening racers as the season progresses towards Nationals, he’d made a few additional tweaks to dial up the pain: instead of a double set of double barriers on the meadows at the base of the hill, the course now had a single barrier on the flats, with the remaining three barriers placed on the hillside runup for the further sufferation of the short of leg; riders now had to fight for the single smooth line up the gravel road before plunging down the winding dirt track all the way to the base of the knob and the hairpin turn at Casebolt Corner (scene of Jason Casebolt’s memorable ankle-breaking wipeout a few years back). With Alex on chauffeur duty, the Recycled Cycles Sprinter brought the team gear along with passengers David and Andrew to Steilacoom in time to claim a prime course-side spot scouted out by dad-and-son team of Rob and Thomas. RCR was represented in the 9:15 time slot by Rip (fortunate that he and Andrew share a shoe size) and David in the open Cat 4, with David getting a morning warmup on his single-speed for the afternoon’s single-speed race, while Rob took the start on his geared bike in the second wave featuring the cat 4 35+ Masters. Rob would not only find himself enforcing the laws of natural selection on the squirrel population, a rolled clincher would force him to run for the finish – but he still managed to stay a step or two ahead of DFL. The women cat 4 field took off in 10:15 slot, with Heather storming to the front to lead the field through the barns and on to the hill. But an inopportune mechanical problem dashed her hopes, when she had to come to a complete halt to fix her brakes. Heather nonetheless soldiered valiantly on despite the aggravation. In the noontime main event, the open cat 1/2 race, Alex struggled to overcome mechanical contre-temps, clawing his way into the top-ten, a result that’s raised him into 10th place in the series standings. As usual, the 1:30pm event is the busiest of the day, as successive waves of single-speeders, masters, and women sped down the tarmac from the starting line towards their first encounter with the grass and mud. Following his morning cat 4 race with an afternoon start among the singlespeeders, David proved that success is often just a matter of showing up, as his consistency propelled him to 8th place in the general classification for the series. He was joined at the start line by Rob, who’d decided to investigate this single-speed madness for himself, fortunately avoiding a second untoward encounter with wildlife. Andrew suffered from the error of underinflation on the extensive tarmac and the hubris of overgearing on the hill, his running legs unable to exercise their slight advantage as the non-runners clogged the lanes on the runup. But he managed to retain a dignity momentarily threatened by a mishandled last turn through Casebolt Corner. Jamie took her first start as a newly-minted Category 2 to join Beth, Julie and Liz in the Category 1/2 Women’s field. Just emerging from several weeks under the weather, Julie was happy to find her slot and stick with it to finish 7th, just behind Beth whose sixth place keeps her in ninth place in overall standings, despite a missed race. Jamie weathered the shock of the new, as she discovered the higher categories select for both fitness and bike-handling skills; Jamie notes that the Cat 3 women aren’t nearly as aggressive through the corners. In the day’s final event, the open Category three men, we had Nick A and Jeff showing the blue-and-gold to finish off the proceedings with worthy efforts, as Nick just nosed out former teammate Matt Beers in a hard-fought contest, while Jeff was happy to be back from a hiatus of a couple of seasons to turn the pedals in anger once again. Then the day was done, and the van was loaded. 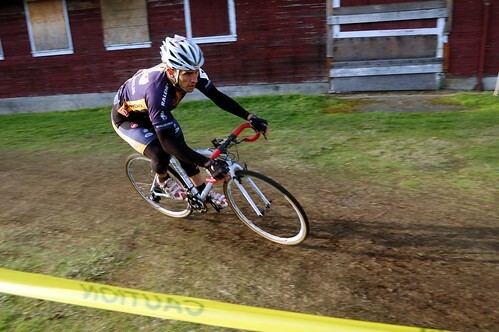 Next week, we’ll be at it again in Seattle’s Woodland Park for the season-closer of the MFG series. As always, we are grateful to our outstanding team sponsors: As always, we’re grateful to our outstanding sponsors: Recycled Cycles; Raleigh Bicycles; Schwalbe tires, FSA; our grilling was made possible by Bill the Butcher, with additional energy furnished by PowerBar Energy Gels.